Understanding of Metrology and Test, and their effective application, is a core part of Reliance’s company philosophy. Inspection and measurement disciplines are embedded throughout the manufacturing processes in order to prove parts are manufactured correctly to the customers’ specifications. Investment in test engineering has led to the development of unique test facilities to support the functional test of completed assemblies, and offers the capability to custom-design test equipment and processes to suit different customer applications and performance criteria. 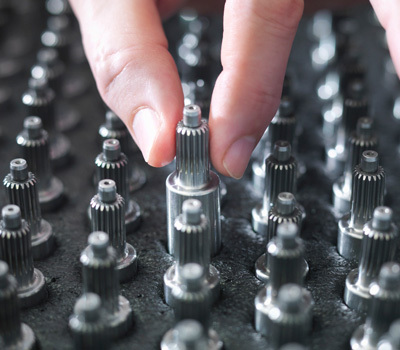 In-process inspection is a core part of Component Manufacturing. Each engineer takes responsibility for the inspection of everything they produce so that subsequent operational areas are confident that the item meets specification. Training is provided in the use of metrology equipment; each engineer holds their own individual certificate showing their scope of skills. Importantly the training is validated to ensure that each engineer is capable of demonstrating the necessary understanding of what is being measured and why. Sample inspection is undertaken at the end of all manufacturing processes to verify the quality of final components to ensure that they have been manufactured to specification, drawings and critical features, and that all the appropriate customer documentation, materials traceability and process details have been provided. A “First Article Inspection Report” (FAIR) is carried out on each new item to validate the manufacturing process and to ensure that all the features have been included and meet the specification. 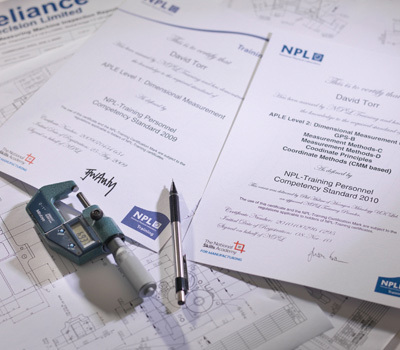 Principle Supply Chain Engineer, MBDA UK Ltd.
Reliance’s longstanding experience in metrology has resulted in an Advanced Prior Learning Experience (APL) accreditation from the National Physical Laboratory (NPL), the UK’s national measurement institute. “I was very impressed with the extent of Reliance’s knowledge, both theory and practical”. All measurement and test equipment is calibrated in accordance with recognised national standards. This calibration is traceable to equipment calibrated by a UKAS approved calibration laboratory. 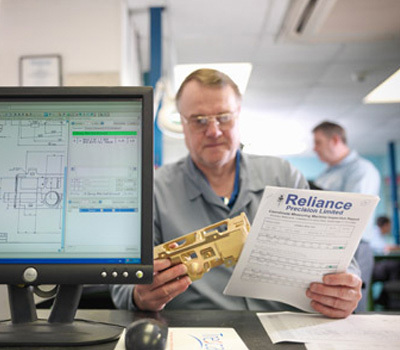 Reliance employs a full-time, on-site calibration engineer in addition to using third party nationally accredited calibration laboratories. 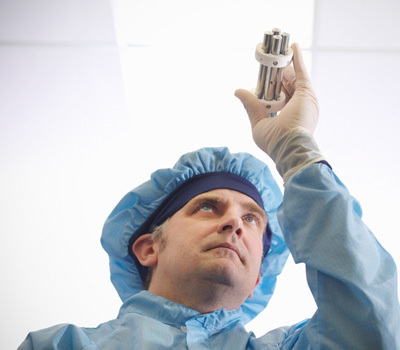 The inspection process continues through from Component Manufacturing into Assembly. For geared and linear mechanisms the accuracy, dimensions and functionality (e.g. torque, speed) are inspected and measured. Reliance’s proprietary Transmission Error Measurement System (TEMS) is used to measure the accuracy of a system from input to output. This not only validates the system, but also helps identify any anomalies in the component and highlight potential design issues. Non-mechanical mechanisms, e.g. analysers, are inspected and measured to validate the overall geometry of the assembly. The operation of the assembly may also be simulated in the parent product using a known, calibrated control sample. 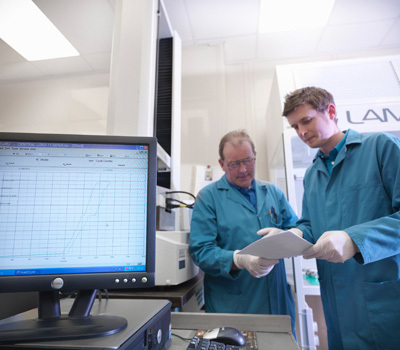 With access to a range of test facilities in the assembly areas as well as a dedicated development test laboratory, Reliance is able to undertake formal acceptance testing should it be required. Typically this would cover an agreed set of tests against various critical aspects of the design specification. A range of test documentation can be provided, from test data and graphs to fully customised test reports. Tests are tailored to individual customer requirements, based on the customer’s own test specification or we can design the test specification on their behalf. We offer flexibility to use the customer’s test equipment, our own in-house equipment, or we will develop our equipment for the customer. A high level of care and attention is given to understanding and interpreting test results and experience is drawn upon from working on assemblies designed to operate in a diverse range of applications. Reliance’s thorough approach to production acceptance testing means that if an assembly is shown to meet the test criteria but an anomaly is identified, consideration is given to the possible impact. If it is thought that it might present a risk to long-term performance, then the assembly will typically be investigated to look for ways to improve its performance against the specification. 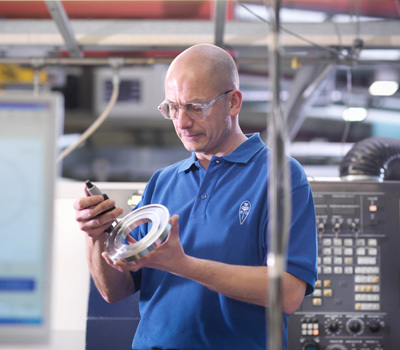 Highly flexible test tools and access to development engineering resources enable Reliance to support the design phase of new product introduction, as well as supporting quality control in Manufacturing and Assembly. For further details of how Reliance incorporates testing skills and experience at the design stage, view the design verification page. Quality is a core company value, so we flow this proactively through our supply chain, working with our suppliers to identify potential risk areas in the manufacturing processes in relation to our contract requirements. We include our suppliers in our ongoing business improvement programmes and share any specific problem areas we might have encountered ourselves. We also agree key metrology principles, tools and technologies to ensure our commitment to measurement is also maintained consistently. For information regarding our quality accreditation, visit our Quality Management page.